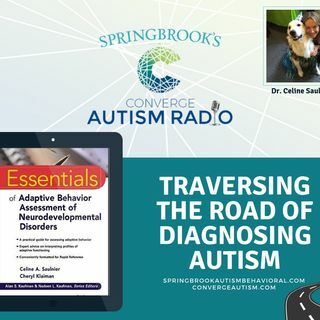 Dr. Celine Saulnier has been a presenter at the annual Converge Autism Summit presented by Springbrook Autism Behavioral Health. She joins us today to discuss the often rocky road of correctly diagnosing Austism Spectrum Disorder. Dr. Saulnier obtained her doctorate in Clinical Psychology from the University of Connecticut, after which she completed a postdoctoral fellowship at the Yale Child Study Center under the mentorship of Dr. Ami Klin. After her postdoc, Dr. Saulnier joined the Yale ... See More faculty, where she became both the Clinical Director and the Training Director for the Autism Program, managing and supervising multidisciplinary diagnostic evaluations on individuals with autism spectrum disorder (ASD) from infancy through young adulthood. At Marcus Autism Center, Dr. Saulnier is the Director of the Clinical Assessment Core for the NIH Autism Center of Excellence (ACE) grant, overseeing clinical and diagnostic evaluations on infants and toddlers with and at risk for ASD. In addition to her research on early detection, Dr. Saulnier’s research focuses on profiles of adaptive behavior in autism spectrum disorder, particularly on the discrepancy between cognitive ability and the application of functional skills to daily contexts and routines.